The Bush Center today held its second national summit in support of veterans and their families at the George W. Bush Presidential Center in Dallas. 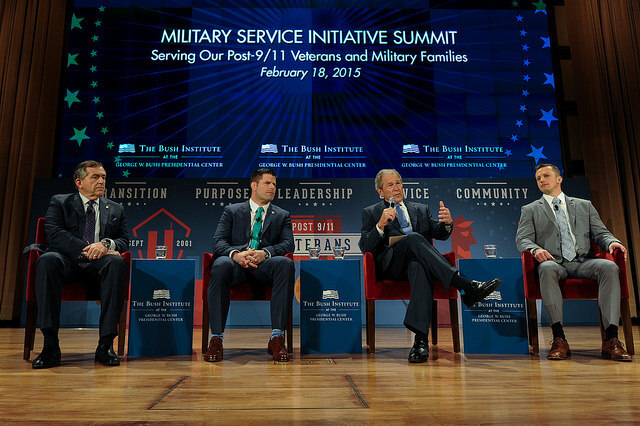 The summit, "Serving our post-9/11 Veterans and Military Families," featured the Executive Directors of two NCHV member organizations. One of the Bush Center's ongoing priorities is promoting the smooth transition of military personnel into civilian life. Todd Baxter, Executive Director of Veterans Outreach Center in Rochester, NY, spoke on "the Community Component," and Michael Blecker, Executive Director of Swords to Plowshares in San Francisco, was featured on the "What do organizations and funders need to get there?" panel. The Bush Center also released its new report on the same topic, Serving our post-9/11 Veterans: Leading Practices among Non-Profit Organizations. Veterans Outreach Center and Swords to Plowshares were both featured as best practice examples in this report. To view a video recording of today's event at the Bush Center, and to access reports and resources for funders, community organizations, and veterans, click here. Veteran in crisis? Dial 1.877.424.3838 for 24/7 assistance.